Be fresh! Kiss My Face Active Life Aluminum Free Deodorant's clinically proven formula will keep you fresh and confident all day long. Time tested botanicals and effective odour absorbing ingredients work outrageously well in this naturally scented, cooling formula. had an allergic reaction to this product. the deodorant did not help with the sweating and odor. I was still perspiring a lot. nice scent though. 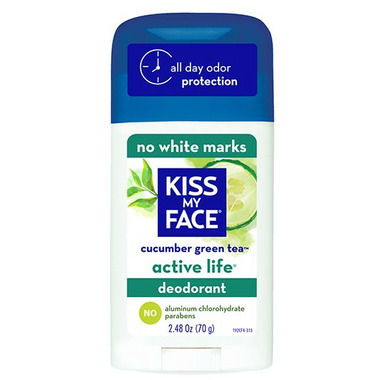 I love the Cucumber Green Tea deodorant! It goes on smoothly, cuts down on sweating, smells lovely, lasts all day. It goes on smooth and is gentle on the skin. Just don't over apply coz you'll end up with white creases. Smells great! Some days I do have to reapply after several hours, which I don't mind. I was really impressed with this deodorant. I have been trying as many natural and aluminum free deodorants as I can find and what I love about this one is how light weight it is, I find that most natural deodorants are heavy and almost like a paste , it goes on clear leaves no marks and smells great through full day wear. I tried many "natural" deodorant before and never got very good results. This one works wonders on me. The smell is not too strong, generally gender neutral, fresh. I love it! Works great. Smells great. But leaves a film that peels and looks horrible like a sunburn. You have to scrub hard to try and get it off and for me with super sensitive skin this is hard on the skin. I like the feel and texture of this product. It seems to do what other deodorants do which is to provide some help controlling odor. But, unless one is using an anti-persperant, it is virtually impossible to go a whole or even half day without evidence that we are human! So, this product works as well as some others I've tried, but I find the cucumber smell quite pungent. More of a manly smell, I think. I had never had any interest in "natural" deodorants before, but I've becoming increasingly aware of how chemicals affect my body, specifically triclosan. I love the scent and it really does work - I'm dry all day. I have tried many aluminum-free deodorants. This one is the best so far. Clean smell. Works better than the pricy Lavanilla. I will repurchase this from Well.ca again. I wanted to like this deodorant, but... It gets one star for the pleasant and subtle scent, which I like. Unfortunately I had a bad reaction to the product, my underarms burning red after an hour, and I had to wash it off. Same effect when I tried it again a few days later. I've gone back to using the slightly less convenient but effective and non irritating deodorant crystal. I have had a hard time finding a natural, aluminum-free deodorant that actually reduces odor and sweat. This one does both effectively, and has a subtle and pleasant scent to boot. I'm very glad to have discovered this product. This smells really good, but it only works for about an hour. I rated this deodorant a 4 as I haven't worn it in summer yet, which is the real test of a product like this, I think! I have been using it regularly since buying it a few weeks ago, and so far, I like it. It seems to do the job. I like the cucmber scent and it doesn't sting when applied. Looks like a product I will keep using.